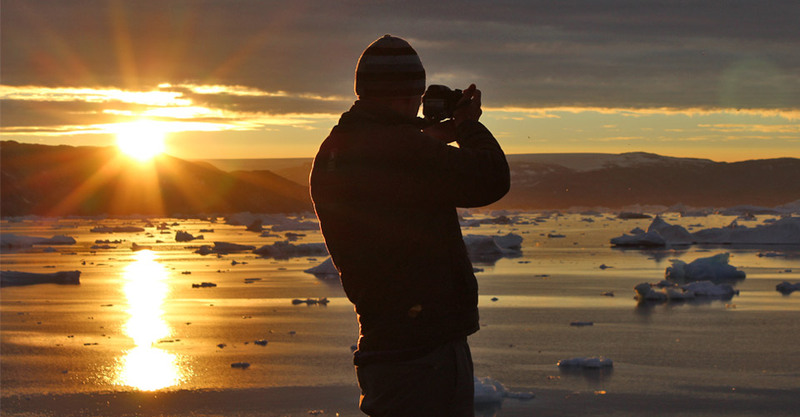 When is the best time of year to visit Greenland? 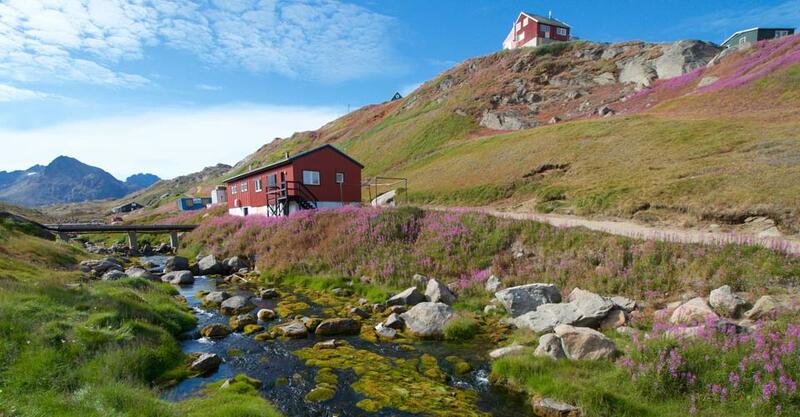 Most tourism in Greenland takes place during the summer months when days tend to be clear and temperatures moderate. Unlike much of the northland, the season in East Greenland starts a little later in the summer (so ice can melt and boats can journey through the fjords) and continues through the beginning of September, when the channels are still clear. Of course, it can be sunny or rainy on any given day, and the weather plays an important role in the activities we participate in. The most hours of daylight occur in July and begin to decline in late August/early September, when temperatures also begin to drop. The advantage of late season trips is the greater chance to view northern lights! The months of July through September are marked by long days of sunlight with temperatures that may range from 43 to 57°F. July and August tend to be a little warmer, with temperatures cooling down in September. On land, the temperature feels a bit warmer than it will when participating in activities on the water. Will the weather in Iceland at the beginning and end of the trip be similar to East Greenland? In Reykjavik, Iceland, expect the daily high temperatures to be in the high 50s, with approximately one-third of the days experiencing rain of some sort. East Greenland tends to be a few degrees colder with less rain, comparatively. What time does the sun rise and set in Greenland during the summer? In mid-July the sun rises at 2 am and sets at 11 pm, though it never really gets dark; the sun just hides for a few hours behind the mountaintops. In mid-August the sun rises at 4 am and sets at 9 pm, with the nighttime still quite a bit lighter than we may be used to at lower latitudes. Our final trips of the season see the sun rising at 5 am and setting at 8 pm, with relative darkness setting in at around 10 pm. 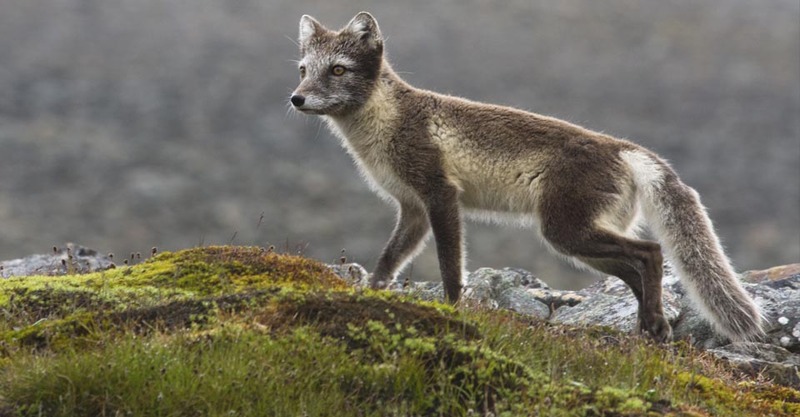 What wildlife will I see in East Greenland? 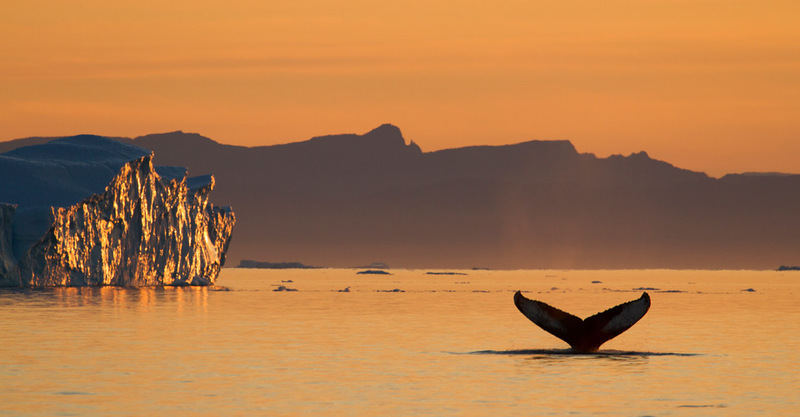 The waters of Greenland are teeming with life! While we will likely see ringed, bearded, or even harp seals among the sea ice, the real gem of this adventure is viewing humpback, fin or minke whales from our Zodiacs or kayaks. 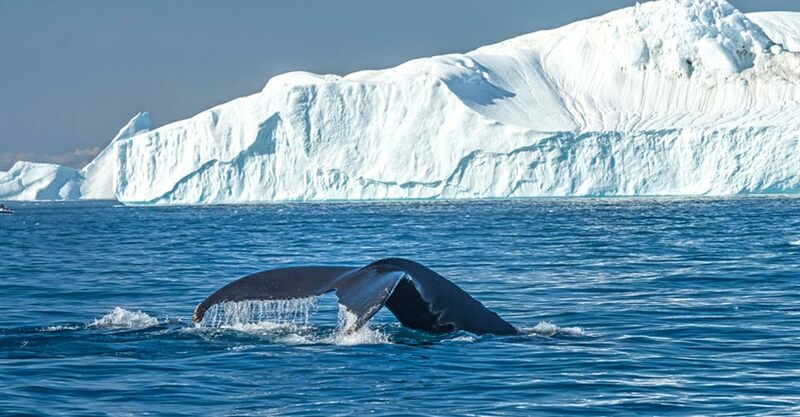 While many nature enthusiasts have viewed these whale species elsewhere, only a select few have had the chance to observe them in such an intimate manner, at eye level, with towering icebergs and snow-capped mountains as a backdrop. Birds also abound, with regular sightings of northern specialists such as black guillemot, northern fulmar, northern wheatear, snow bunting and occasional rock ptarmigan. Other exciting wildlife that have been seen less regularly on this trip are arctic fox, hooded seal and gyrfalcon. Does the wildlife viewing vary much from the beginning of the season to the end? No, as the wildlife encounters depend on the ice conditions and other natural factors that are hard to predict from year to year. The only real difference in the experience from month to month during our season is that the temperatures drop a bit in September, making for cooler mornings and evenings. However, September also brings the chance for northern lights, which is quite popular among our guests! Will there be an opportunity to speak with local Greenlanders and learn about Greenlandic culture? 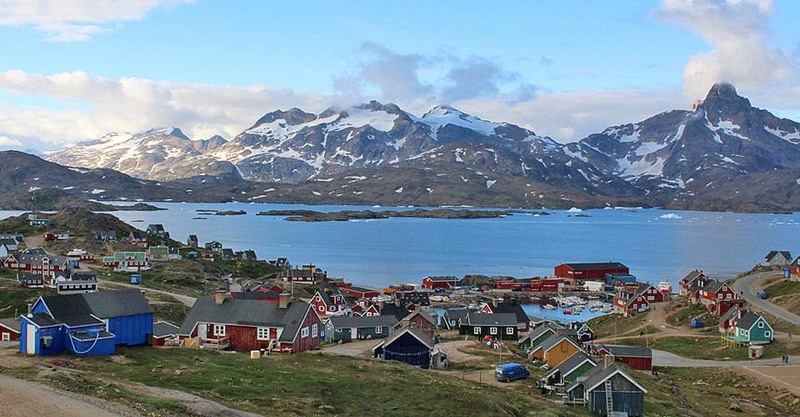 In Kulusuk, Tasiilaq and the small village of Tinit we will be able to meet people from East Greenland and learn about their culture and history. We will visit the town museum in Tasiilaq. Since we stay in the settlement during a portion of this trip, we will engage with local Greenlanders and learn more about their lifestyle. What type of clothing should I pack for East Greenland? You should pack with wind and cold temperatures in mind as our time on the water can be chilly. Warm, waterproof rain gear is essential, and dressing in several layers is imperative because weather can change quickly. Nat Hab guests will receive a comprehensive packing list prior to their trip. 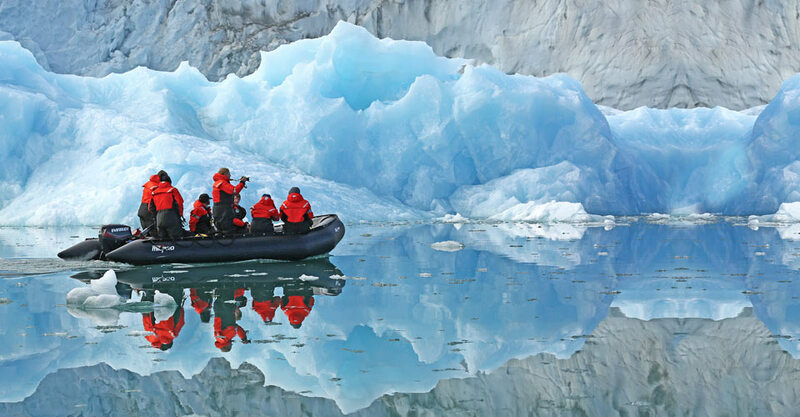 In our Zodiacs, we will outfit you with highly effective expedition suits that are flotational and very warm. We also provide fleece neck gaiters to keep. For further details of what to bring, peruse this helpful packing list and check out Nat Hab’s online Gear Store for some of the key items recommended for your adventure. Will there be adventure equipment available at Base Camp Greenland? Yes. 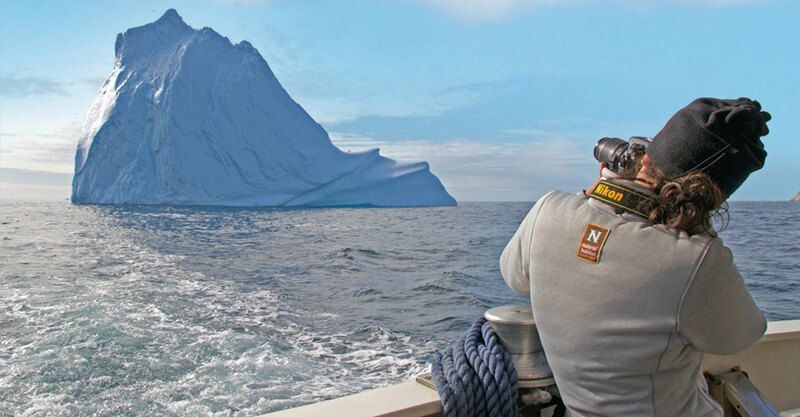 We provide guests with flotational expedition suits to stay warm on Zodiac rides, garden clogs (Crocs) for use in your cabin and around camp, all sea kayaking equipment (kayak, paddle and personal flotation device), kayaking booties, paddling gloves, a dry bag and trekking poles for hikes and walks over uneven terrain. Will there be any cold-weather gear provided at Base Camp Greenland? We’ll provide expedition suits and fleece gaiters to keep you warm on Zodiac rides while we’re exploring the coast, but you will need to bring your own warm layers (i.e., insulated jacket, fleece, hat, gloves, etc.) for daily activities. How strenuous is the kayaking and hiking at Base Camp Greenland? Off-trail walks and hikes require good mobility and stability as the terrain is rocky and uneven. Generally, our walks are a few miles in length, although there is the possibility of additional, longer hikes for those who desire. The kayak trips tend to be casual, slowly cruising the coastline taking in the views, covering perhaps an average of 5 miles per trip while supported by a Zodiac following us. Again, longer trips may be available for those who desire. All activities are optional, and alternate options may be available at varying levels of physical demand depending on weather and safety. You must be able to walk at least 2 miles over uneven, rough ground to participate in this trip. Please click here for the explicit physical requirements of our Greenland adventure. 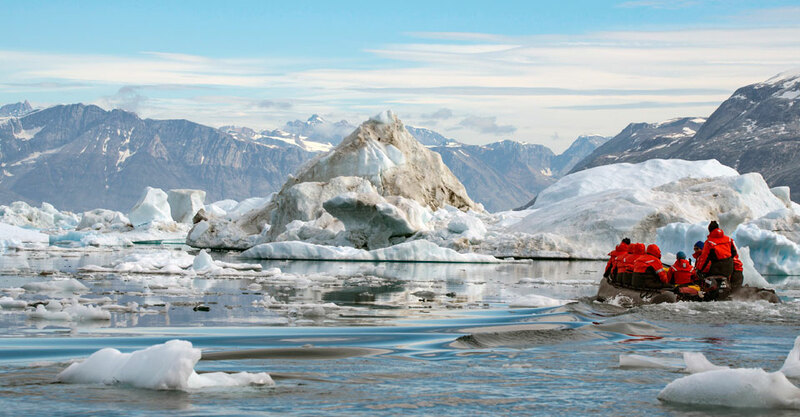 Do we use single or double kayaks on this Greenland tour? We generally use double kayaks on this adventure (although we keep a couple singles on hand) and match guests with traveling companions or by ability. 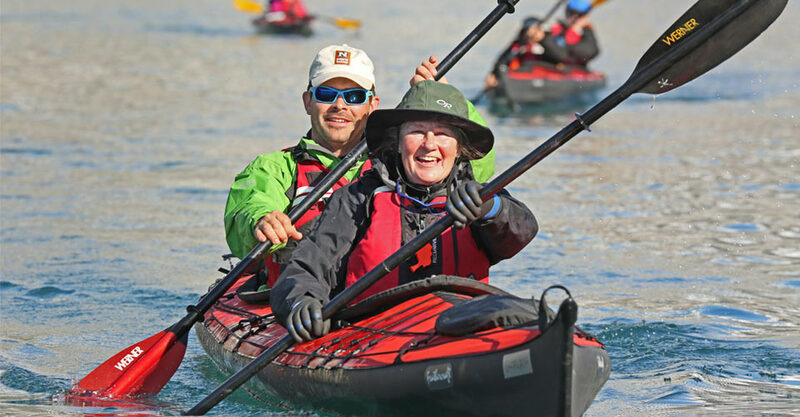 Each kayak excursion includes a kayak guide and a support boat, as well as an Expedition Leader or two, depending on how many guests participate. Will the water be choppy in East Greenland? What if I am prone to seasickness? The water can be smooth or choppy in East Greenland, depending on the weather and season. Much of the trip’s transportation is by boat or Zodiac, so if you are prone to seasickness it is recommended that you bring medication or preferred remedy as a precaution. Is the helicopter flight doors-off for optimal picture taking? No. We keep the doors on for our helicopter flights in Greenland. What makes Base Camp Greenland a “luxury” safari camp? Although an isolated, extremely rural locale, Base Camp Greenland offers an assortment of luxurious amenities usually reserved for accommodations set in far more populated areas, or in Africa where the access to building materials is much more readily available than it is in Greenland. The cabins—adapted from a design used by Arctic oil exploration companies—are surprisingly spacious, with cozy comforters and pillows, and a private veranda with an incomparable view of the bay. Each cabin has its own toilet and wash basin, and close by are hot showers in a separate bathhouse with men’s and women’s sections. 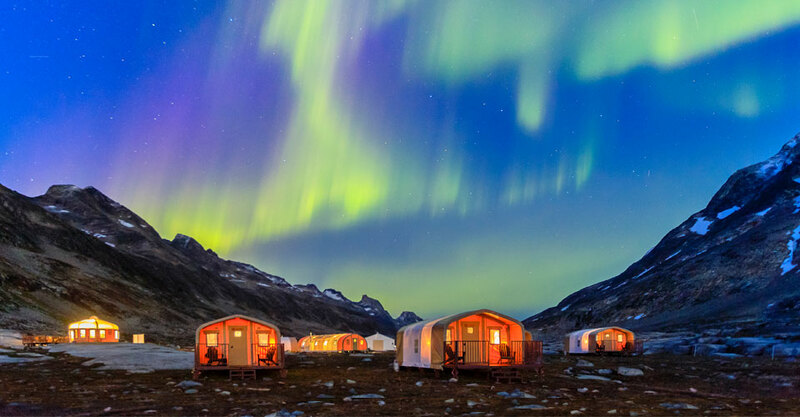 One of the things that separates Base Camp Greenland apart from any other accommodations is its eco-conscious design, which serves to actively minimize its ecological footprint on the surrounding wilderness. Do the tents have bathrooms at Base Camp Greenland? Every tent cabin has its own private en suite, odorless dry toilet and washbasin. Hot showers are also available in a nearby, separate bathhouse. Are the tents heated at Base Camp Greenland? Although the long, comfortable summer days in Greenland are typically mild and dry, nights can get chilly, and each cabin is warmed by its own individual heater. 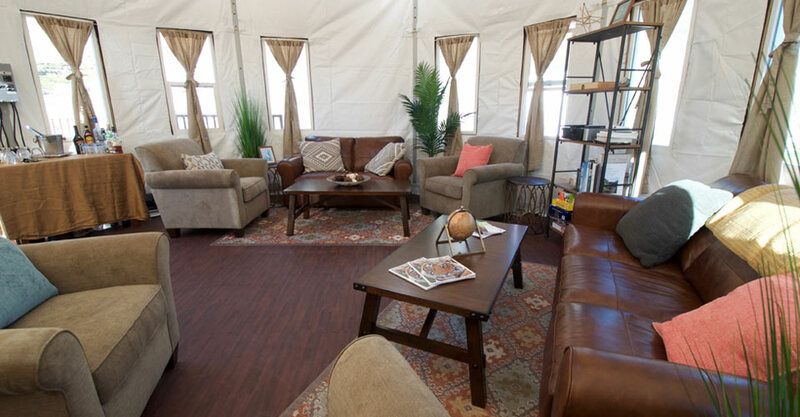 Because of this, travelers can always count on a relaxing respite in their tent at the end of a busy day, no matter the weather outside. What is the food like in Greenland? 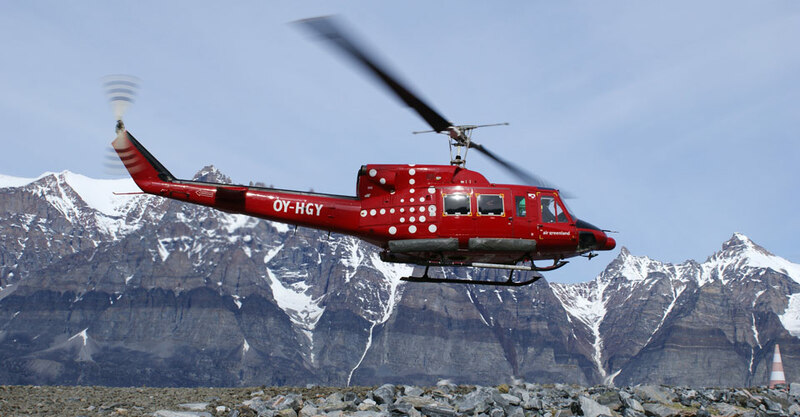 We fly our own chef into Base Camp Greenland to provide guests with unusually wonderful cuisine given the remote location. Meals tend to be styled toward American comfort food, with the occasional local fish. Vegetarians and special dietary needs are easily accommodated at camp. The hotel meals in Greenland are generally buffet style. Please note that few gluten- and dairy-free items exist in this area of the world, and hotels and restaurants are often unable to accommodate special diets. Meals in Reykjavik can generally accommodate special diets. There will be various opportunities for purchasing souvenirs in Greenland, mainly in Tasiilaq. The Danish kroner is the currency used in Greenland, though many souvenir shops accept U.S. dollars and/or credit cards with microchips. Click here to check the current exchange rate. Will there be cell phone service or Internet connection in Iceland and Greenland? Internet access will be available at the hotels in Reykjavik, Tasiilaq and Kulusuk (both for a fee) but note that Internet service at the hotels in Greenland can be unreliable at times. There is no Internet or phone service at Base Camp Greenland. 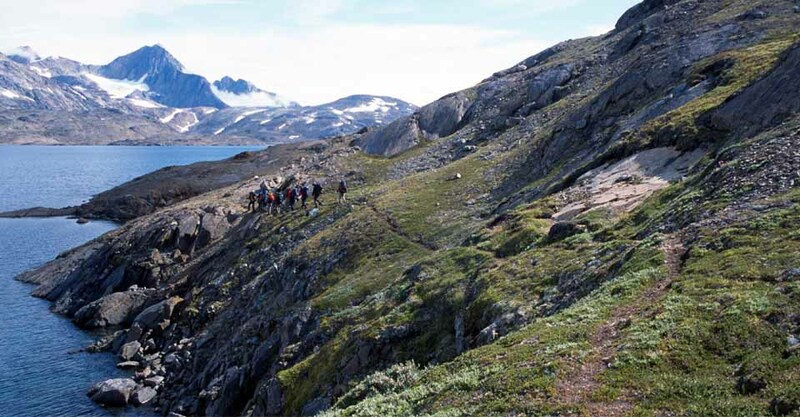 Is this Greenland trip appropriate for children? Though this trip is not specifically geared toward families, well-traveled and curious children of the age of 15 or 16 and older may participate and should generally be capable of participating in all of the activities offered. Can Nat Hab take our family or a group on a private version of the Greenland adventure? What is the best way to get to Reykjavik for the start of this trip? Guests are responsible for booking round-trip flights from their home city to Reykjavik, Iceland. We recommend that you use Natural Habitat Adventures’ Travel Desk, as our Air Travel Specialists are intimately familiar with the requirements of our trips and can arrange the most efficient and cost-effective travel into Reykjavik, and so that Nat Hab has access to your bookings in case of inclement weather. Because weather is unpredictable in this part of the world, it is a great idea to arrive in Reykjavik a day early at the start of the trip to ensure you are not delayed by poor weather. We also strongly recommend staying an extra night or two in Reykjavik to ensure that you do not miss your connecting flight home in case our flight from Greenland to Iceland is delayed or canceled. Please check the Getting There & Getting Home information on the Dates, Prices & Info page for detailed information on required arrival and departure times for this adventure. If I arrive early, what is there to do in Reykjavik, Iceland? Iceland’s capital city, Reykjavik, is compact but packed with a large variety of things to do. Because of this small size, it is very walkable, and you will be able to cover a lot of ground in a short amount of time. Popular museums and exhibitions include the National Museum of Iceland, Aurora Reykjavik (Northern Lights Center), and the Einar Jonsson Museum. Other well-known attractions are the Hallgrímskirkja Church and the Harpa Concert and Conference Center, which is right on the waterfront. Nat Hab is happy to reserve a hotel room for you in Reykjavik before your Greenland tour begins, but please note that pre-nights are subject to availability at the time of booking. Fill out the form below to receive additional information about our Discover Greenland: The Natural Habitat Experience. 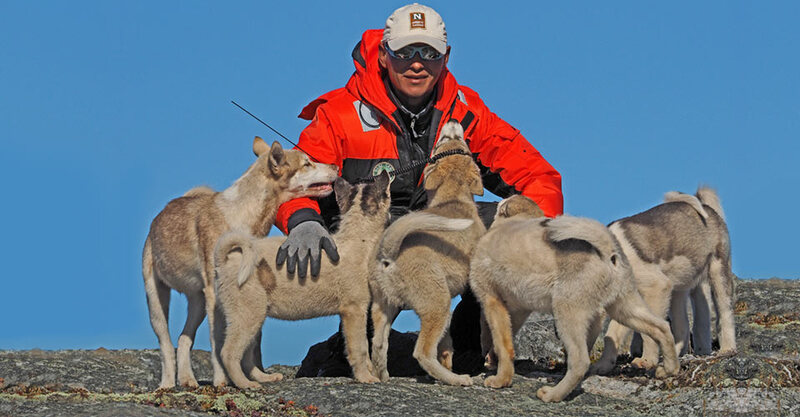 Hi Nat Hab, I’m interested in your Discover Greenland: The Natural Habitat Experience. Can you please contact me with more information?